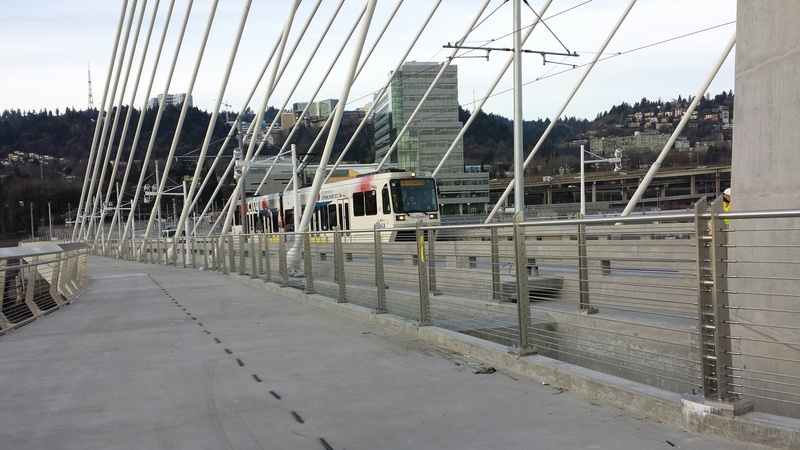 For the first time, TriMet operated an electrified MAX test train on the northern segment of the new Portland-Milwaukie Light Rail Transit Project alignment, including Tilikum Crossing, Bridge of the People, on Wed., Jan. 21. The first MAX train travels over the Tilikum Crossing. A powered Portland Streetcar train also traveled across the bridge during the systems test. The successful test along the future MAX Orange Line verified the interface with the track, the overhead catenary system that supplies power to the vehicles and signals. The first test trains traveled at walking speed. See a time lapse video of the first MAX test train.